A team of Law students from Bangor University is celebrating success at a world-renowned competition for law students. Cathal McCabe, Adam Gulliver, Damian Etone and Andrew Jones made history this month when they became the first team ever to represent Wales at the The successful Bangor Telders Team outside The Hague. 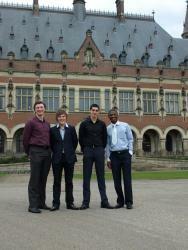 L-R: Cathal McCabe, Adam Gulliver, Andrew Jones and Damian Etone.Telders International Law Moot Court contest. Held annually at The Hague in the Netherlands, it is the most famous international law competition in Europe. Although a Dutch team from Leiden University eventually won the final, Bangor Law School was this year’s best performing British team, reaching the semi-final rounds. Impressively, they came fourth out of 25 in the oral rounds for the applicant sides. During the three-day contest, the Welsh representatives faced teams from Norway, Scotland, Serbia and Bulgaria to plead a fictitious legal case, ‘The Varsho River Dispute’, in simulated court proceedings. The case involved a variety of public international law issues, including territorial disputes, treaty interpretation, shale gas mining and the law concerning transboundary pollution, environmental impact assessments, as well as the rights of future generations. Among those judging the Welsh team were representatives from the Dutch Ministry of Foreign Affairs, the Organisation for the Prohibition of Chemical Weapons, the International Criminal Court, and many more.